knitting and twilight; now if only our little guy would feel better and stop with the sneezing, this would be a perfect saturday! 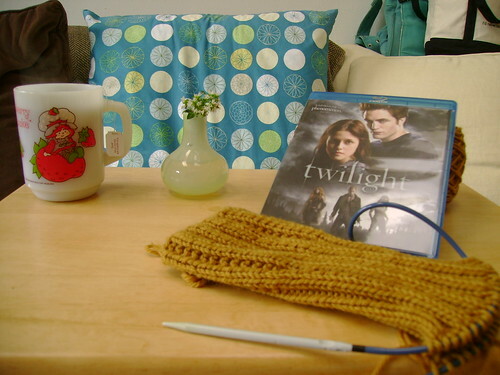 I have that same Strawberry Shortcake mug, and am spending the day watching Twilight, and just downloaded your pattern for Bella's Mittens! It's nice to encounter a kindred spirit online. So how many times have you watched it, and were the special features awesome? tell your littl guy to get better soon! We have already watched it twice. 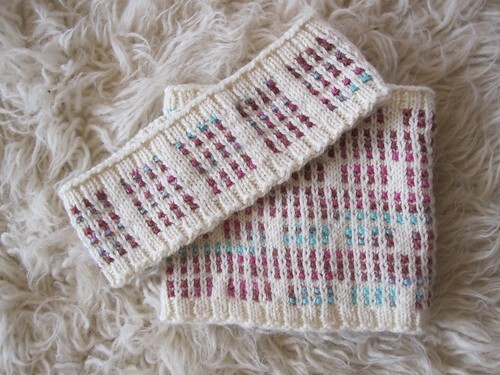 The second time I finished one of two bella mitts, while admiring all the other knitted goodies they are wearing. Now if I can only find a pattern for the beret Rosalie where's I will be all set. Hope your little guy is feeling better. Hi Marielle! 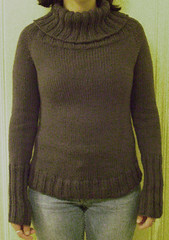 I just found my way to your blog via the Ravelry link for the Bella mittens. Thank you for making your amazing pattern available to all! I have never knitted on DPNs before, nor have I ever knitted cables, but the pattern has me watching knittinghelp.com videos at lunch at work and trying to puzzle through at night. A great challenge! Plus, I read the Twilight series in a feverish 2 1/2 weeks last month, so, like Mae Day! am excited to find a kindred spirit online. I hope your bunny gets better soon. It's the worst when pets are sick.